Come explore Maryhill Museum’s world-class collection of art ranging from early 20th century European works to an extensive Native American collection. Set in a castle-like chateau on a stunning 6,000-acre site overlooking the scenic Columbia River Gorge, Maryhill Museum is one of the Pacific Northwest’s most fascinating cultural destinations and located just 100 miles east of Portland, Oregon. The museum’s permanent collection includes more than 80 sculptures and watercolors by the French master Auguste Rodin, including the only pedestal-sized plaster version of his famous The Thinker, and much more. The history of the Maryhill Museum is inseparable from the life of its founder, Samuel Hill. In 1907, Hill purchased 6,000 acres of land along the Columbia River with the hope of establishing a Quaker farming community. He formed the Maryhill Land Company, named after his daughter, and set about building a town. The village included a store and post office, a Quaker church, an inn, a blacksmith’s shop and a stable. 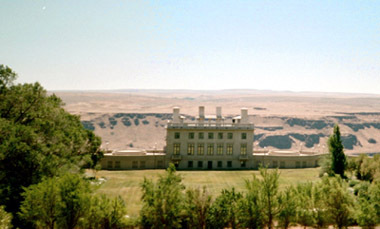 In 1914, work began on a hilltop mansion that was to be Hill’s home, but the remote location of Maryhill and the lack of irrigation proved insurmountable obstacles and the land company failed. 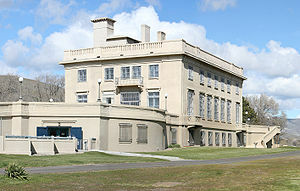 Construction of Hill’s mansion stopped in 1917.